In the Atom properties dialog you can set values to atoms. 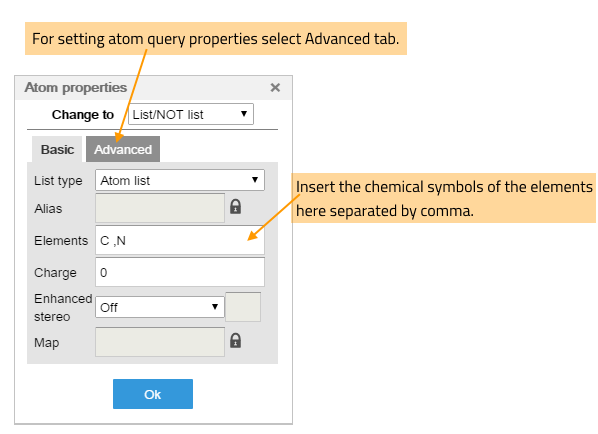 Atomic charges, isotopes, radicals, enhanced stereo specifications, atom maps, aliases can be set in the Basic Tab and query properties in the Advanced Panel. Atom properties dialog window is available from the pop-up menu after a right-click on the atom. In the dialog only the properties which are permitted for every selected atom type are available. 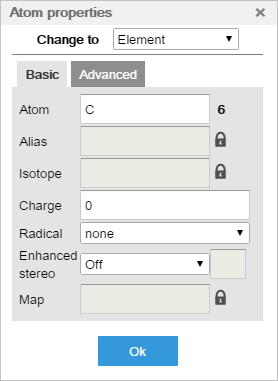 If the selected atoms have attached previously defined properties, you can delete them by inactivating their input field via the "Padlock" icon. 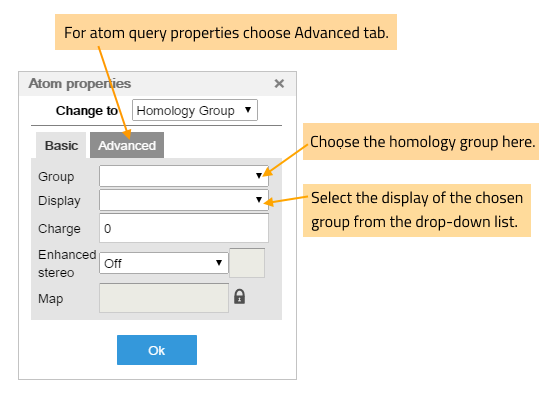 See how to set atom properties for more than one atom here. Atom: the chemical symbol of the element (the atom number appears automatically next to the text field). In case of hydrogen isotopes (deuterium and tritium), their specific atomic symbols (D and T) can be used as well. Alias: a text (a label to an atom) Please, note that the other properties (except query atom properties) will be hidden, however this information is preserved. Ehanced stereo: Off (default), Absolute, And, Or. In the latter two cases a number should accompany the identifier. If you leave the number field empty, number 1 will be associated with the group identifier automatically. Total number of hydrogen substituents. Number of implicit hydrogen substituents. Number of substituents including hydrogens. Size of the smallest ring the atom is a member of. 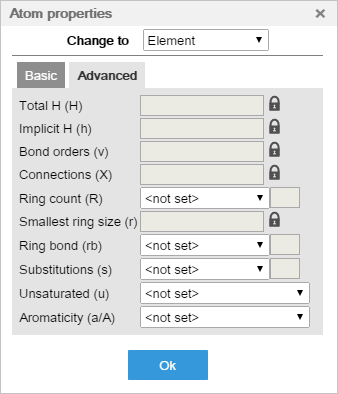 rb4: 4 or more ring bonds. Substitution count: the number of non-hydrogen substituents plus number of isotopic hydrogen substituents. Unsaturated atom: atom that has double, triple or aromatic bond. It defines whether the atom has at least one aromatic bond (a) or only aliphatic (A) bonds.